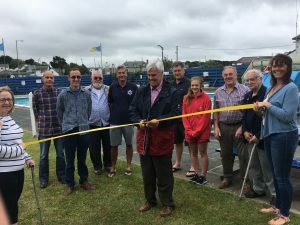 Hayle Outdoor Swimming Pool was opened for the 2017 season by the Deputy Mayor, Councillor Clive Polkinghorne, on Saturday 24 June 2017. Despite the cloudy weather, swimmers were ready to take the plunge into the water which had already reached a balmy 25 degrees, thanks to the solar cover that had been installed during the season last year. We are pleased to announce that there is now adult (16+) lane swimming available on Tuesday evenings from 6.30pm to 7.30pm at £3 per person (free Tuesday passes do not apply). If this proves successful, it is hoped that we shall be able to continue to offer this facility in future seasons. For further information regarding the swimming pool please see the Outdoor Swimming Pool page.